Sometimes I wonder how things might have gone if the meal had been described as “chicken, then waffles.” Were it pitched as sequential instead of additive perhaps we could have avoided the chips, the drink syrup, the scented candle, and all manner of other things suggestive of chicken and waffles but really just twisted summation. What I’m driving at here is that in the past I have insisted that chicken and waffles may arrive at one’s table together but they are not meant to be consumed as such. Many people can and do switch back and forth from one part of the meal to another but I’ve never seen anyone flip the chicken on top of the waffle and go to down on both at once*. It will not surprise long-time readers in the least that I can be a bit of a curmudgeon sometimes, and the above notion is a good example. What does it harm me if folks want to have their chicken and their waffle in one bite? Not a bit, as it turns out, and maybe there’s even a point to it. 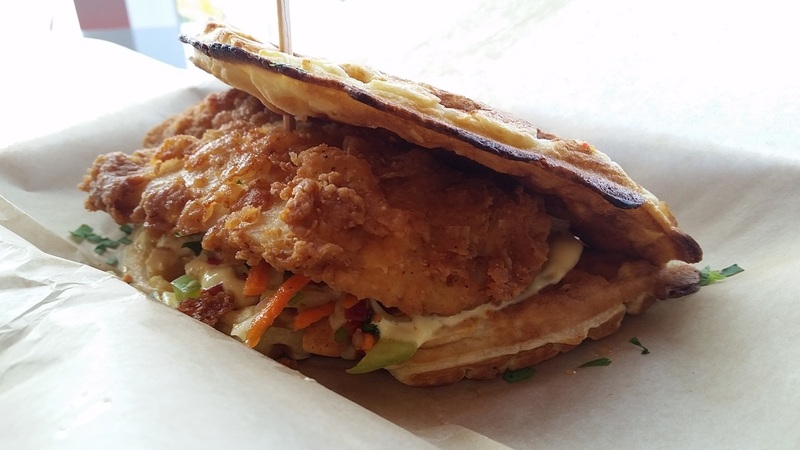 The above sandwich is a waffle, a fried chicken breast, coleslaw and a mustard/mayo combo, and it is quite tasty. I’m not sure it’s as tasty as they would be separate but combined, or whether there isn’t a better bread to use, but in and of itself it’s really not bad. The waffle is sweet with a bit of crunch to it, echoed in the crunch of the chicken, with the sweetness playing well against the mustard and the coleslaw. It still feels silly to me but, in the grand scheme of all the sins a sandwich can commit, silly really isn’t so bad. *Perhaps this is just me and my associates, though? Maybe everyone at Roscoe’s dumps it all into the same bowl the second I step out the door. This entry was posted in Sandwich Reviews and tagged Chicken, Los Angeles, Reviews by Pete, Sandwiches I Have Eaten by Pete. Bookmark the permalink.